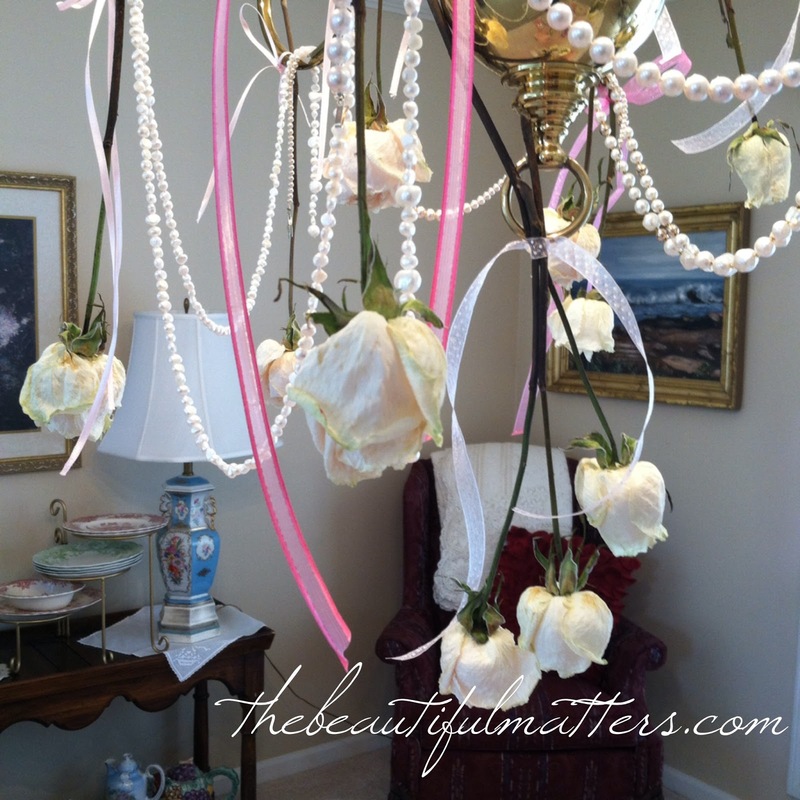 Valentine's Day is not just for young lovers. 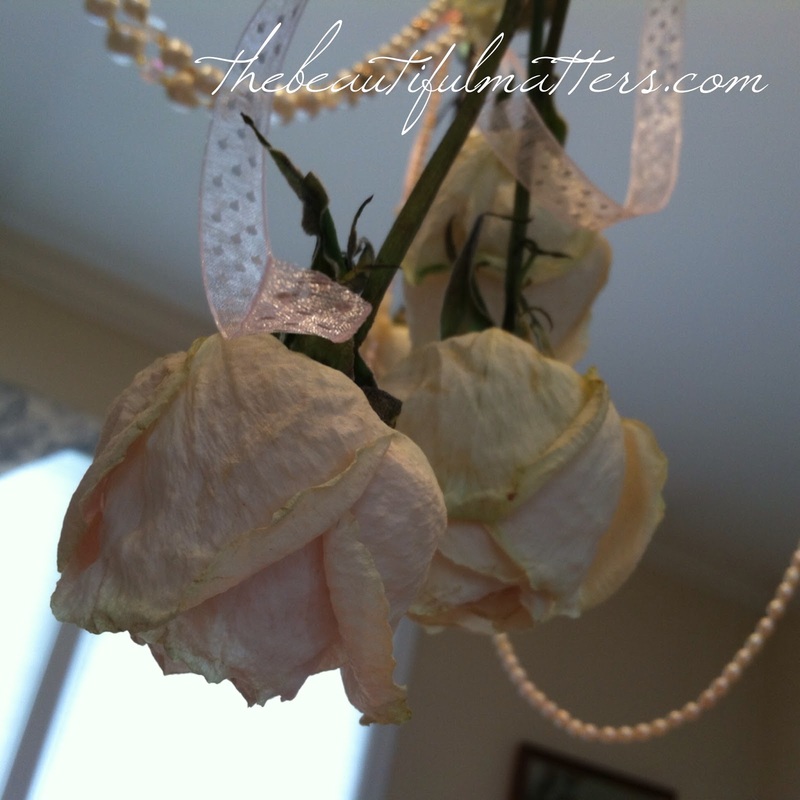 It is also for those of us who have experienced a love that has stood the test of time. A love that has been through bouts of sickness, worries about children and finances, piles of laundry and dishes, as well as a love filled with laughter and happy memories. We need to celebrate love that has persevered through all the ups and downs of life. I am grateful for a husband who gets up every morning and goes to work without complaining. Who takes care of the bills, the tax returns, the insurance. Who snow blows the driveway when it's freezing cold outside and I'm still warm and comfortable in bed. Who raised three amazing children with me. A man who takes us to church and prays for us every day. Is he perfect? No. But neither am I. We get annoyed with each other, and we've had our share of arguments over the years. Perhaps you know what I'm talking about. But those of you who have been blessed to have been married to the same person for many years (32 in our case) know that we have much to be thankful for. Mutual trust, friendship, loyalty, shared memories. A glance across a crowded room that shares the inside joke. Do we sometimes take all of this for granted? I know I do. So what better excuse than Valentine's Day to remember and cherish what we love about our spouses? A romantic dinner out sounds tempting. No cooking and no dishes. But the reality, and we've experienced it, is noisy crowds and exorbitant prices. A dinner at home is much more restful and relaxed, and we can enjoy our favorite foods at a fraction of the cost. My husband is a meat and potatoes man, so I am going to do a classic steak and baked potato dinner. Add a Caesar salad. Easy-peasy. I'll make a simple homemade chocolate mousse for dessert, served in a vintage martini glass, with a dollop of real whipped cream and a strawberry on top. We'll take this and our coffee and go and sit in front of the fire after dinner. Perhaps we'll reminisce about the past and make plans for the future. 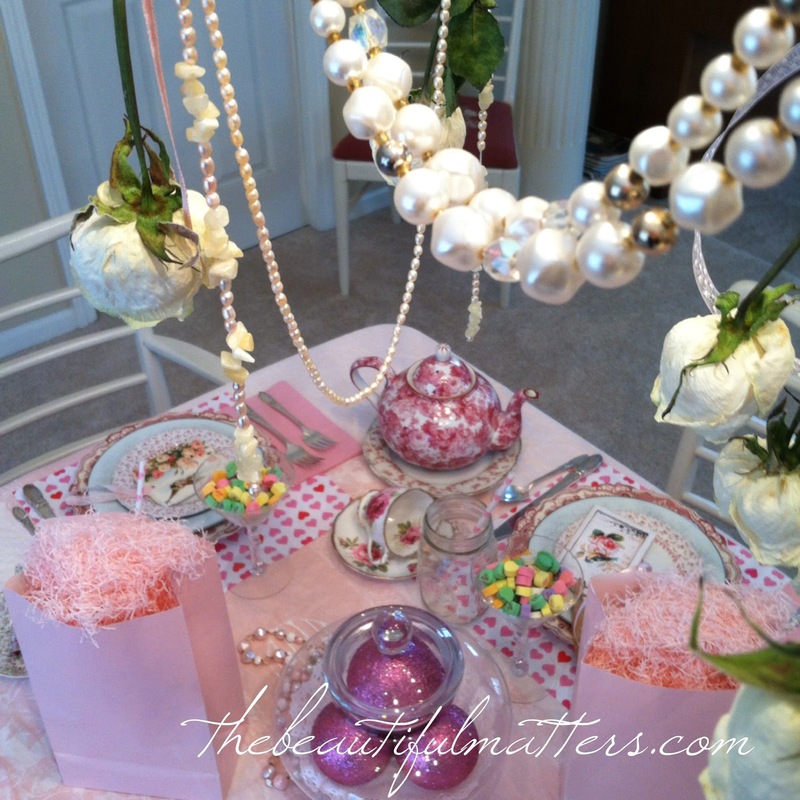 So let me show you this tablescape. 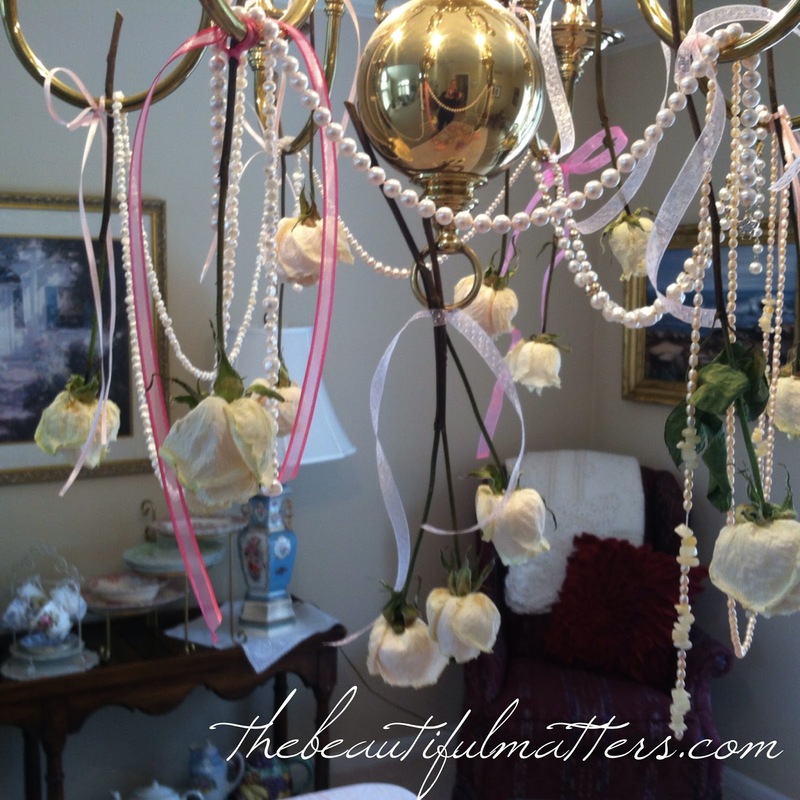 When I saw Bella's post here at Bella's Rose Cottage, I knew I had to hang roses from my chandelier. 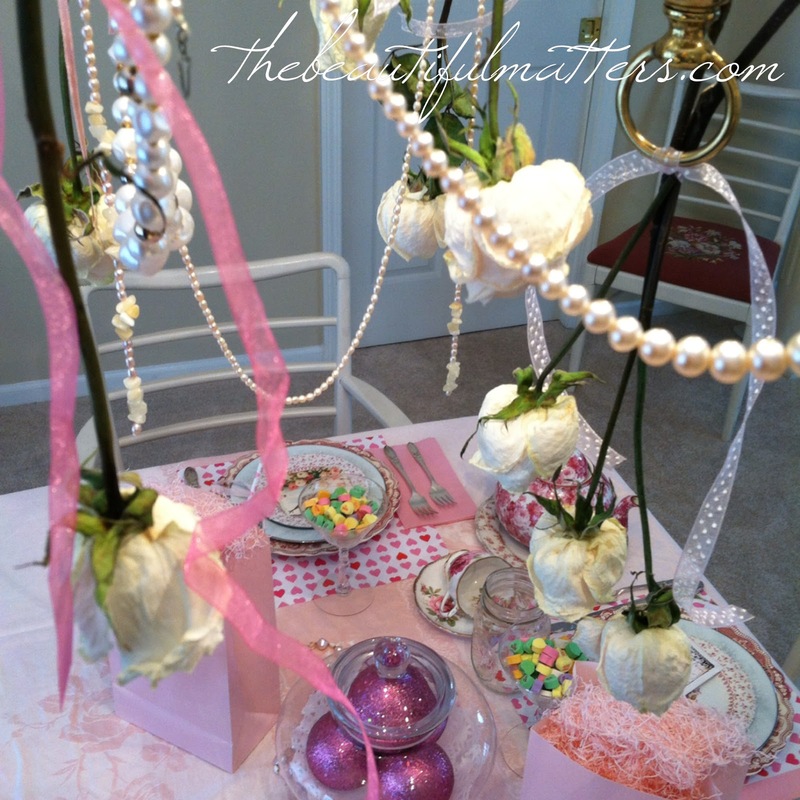 I draped some faux pearls on the chandelier, and added some pink and cream ribbons. 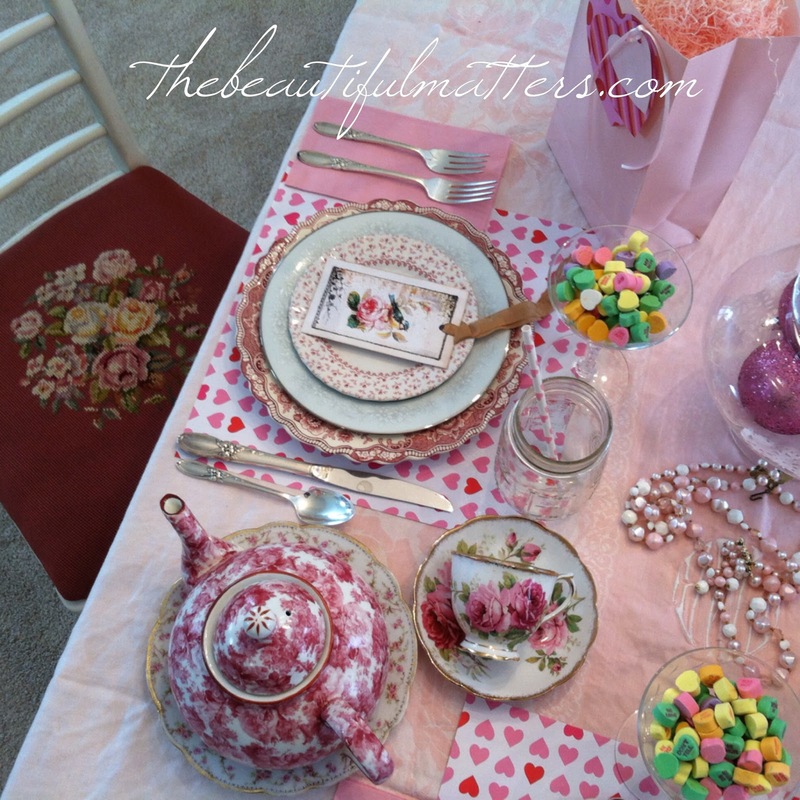 I was so excited about doing this post that I didn't take the time to iron my tablecloth, and then didn't want to dismantle the whole tablescape when I saw the tell-tale wrinkles. 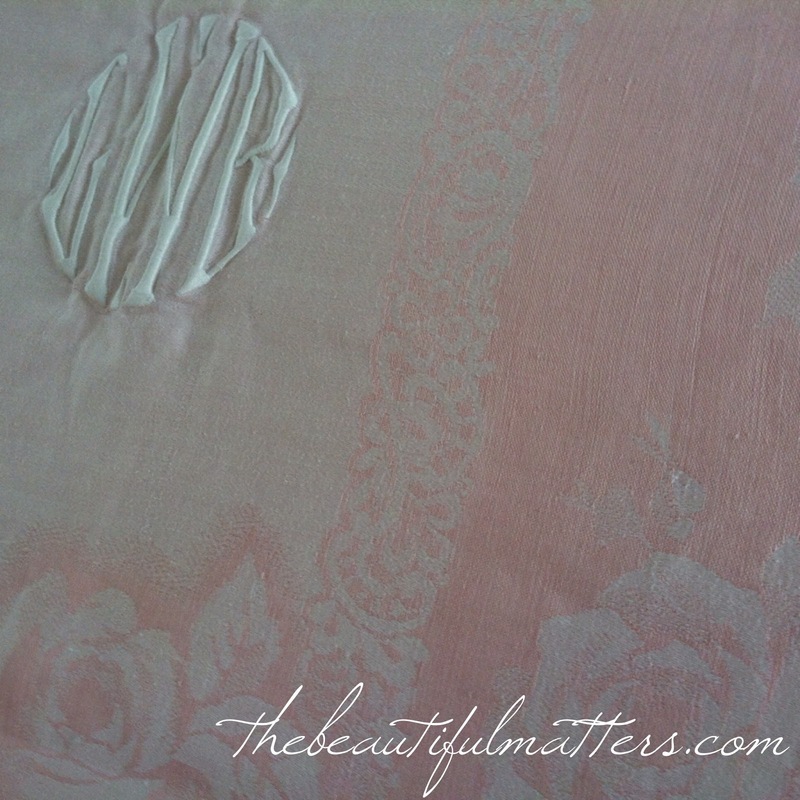 But I did want to share with you this lovely antique tablecloth from my mother's second husband's first wife's mother. That's a mouthful. I believe it is about a hundred years old, and looks like new. So I put a towel under the empty end of the table and ironed it for picture taking! Isn't it lovely? 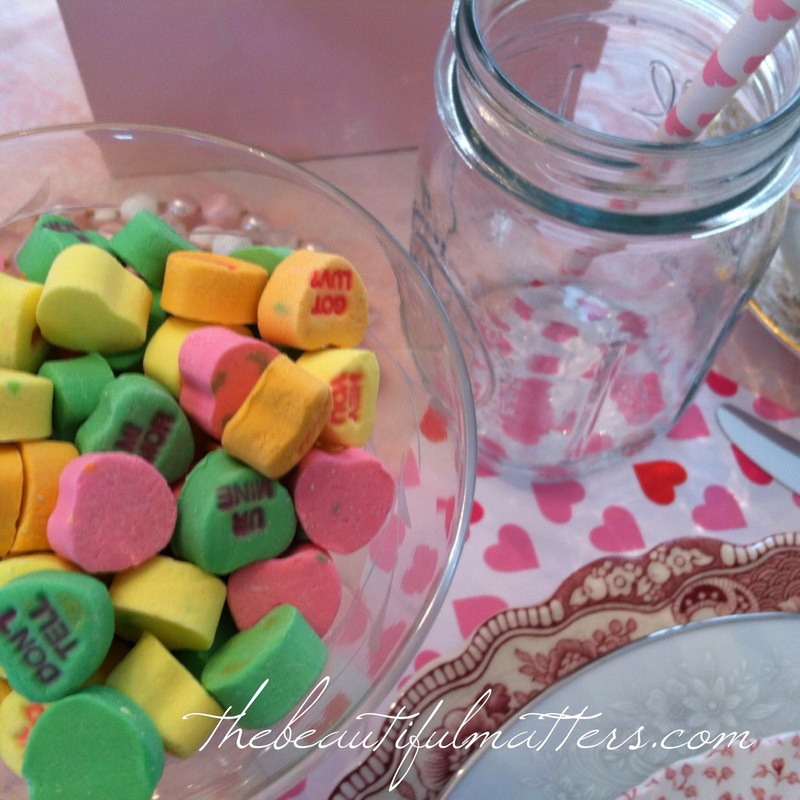 What is Valentine's Day without little candy conversation hearts? They're a ghastly blend of sugars, corn syrup, and artificial colors and flavors, but that doesn't mean I won't still eat some. And a cute paper straw with pink hearts on it from Sur La Table. 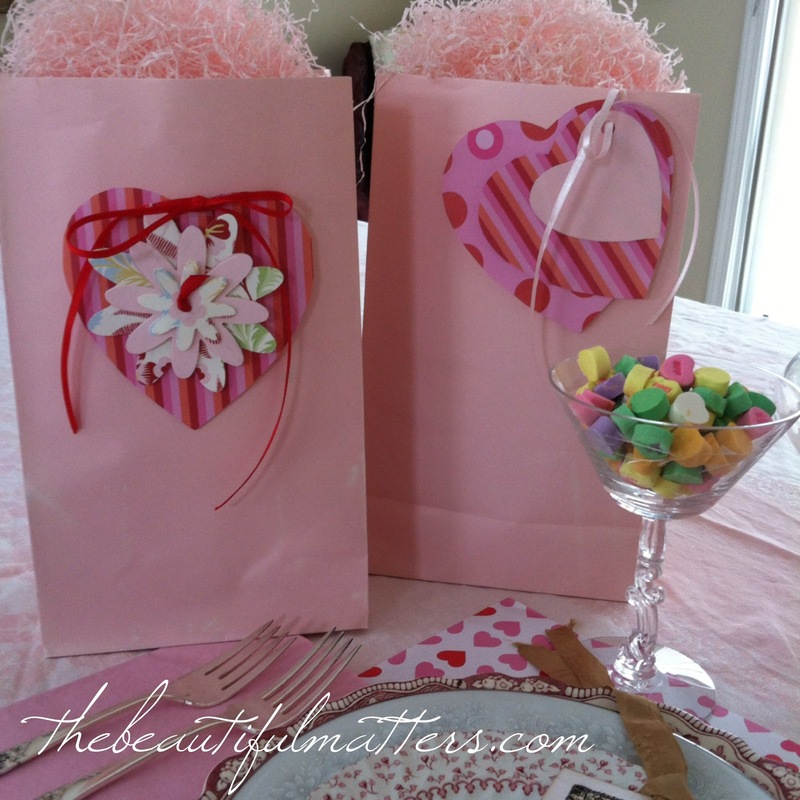 The pink bags are from the Dollar Store. I filled the tops with pink Easter shred, and cut out paper hearts to decorate them with after tracing them from graduated sizes of heart-shaped cookie cutters. The one on the left has a cute flower cut-out that I removed from a card I received. A pretty bookmark for decoration on top of a Rose Bouquet plate by Johnson Brothers, on top of Cumberland by Noritake, on top of Bristol by Crown Ducal. 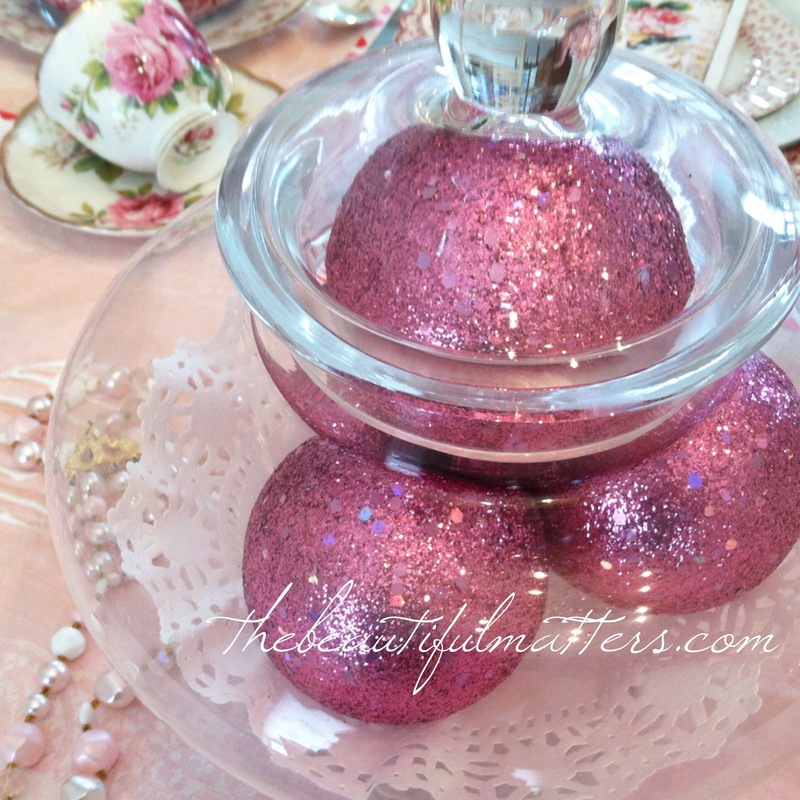 A classic, American Beauty by Royal Albert. 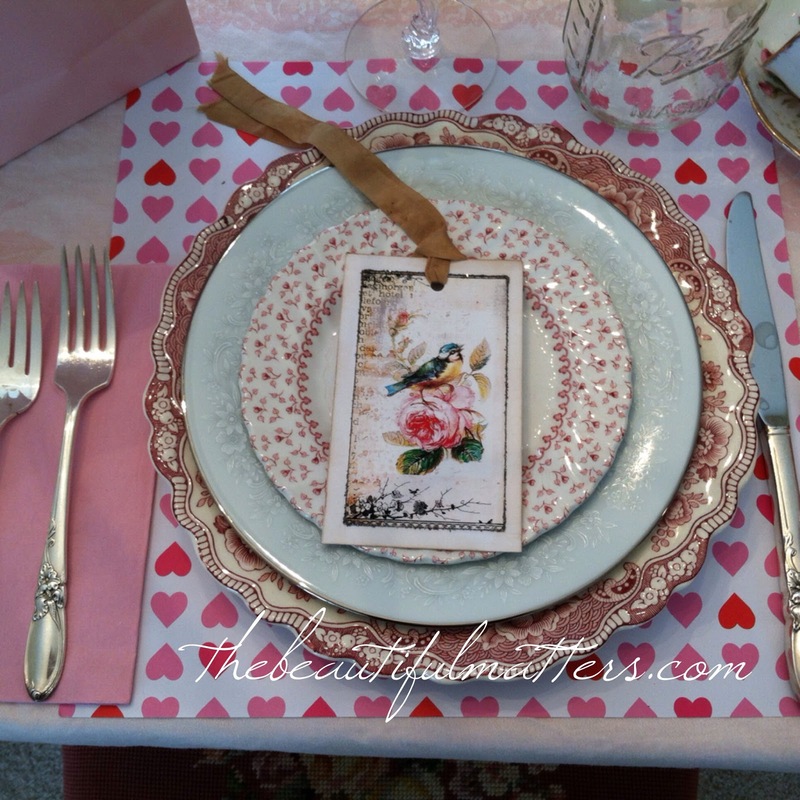 The placemats are sheets of scrapbooking paper. I am sharing today with Between Naps on the Porch, The Charm of Home, Home and Garden Thursday, and Feathered Nest Friday. Pretty! 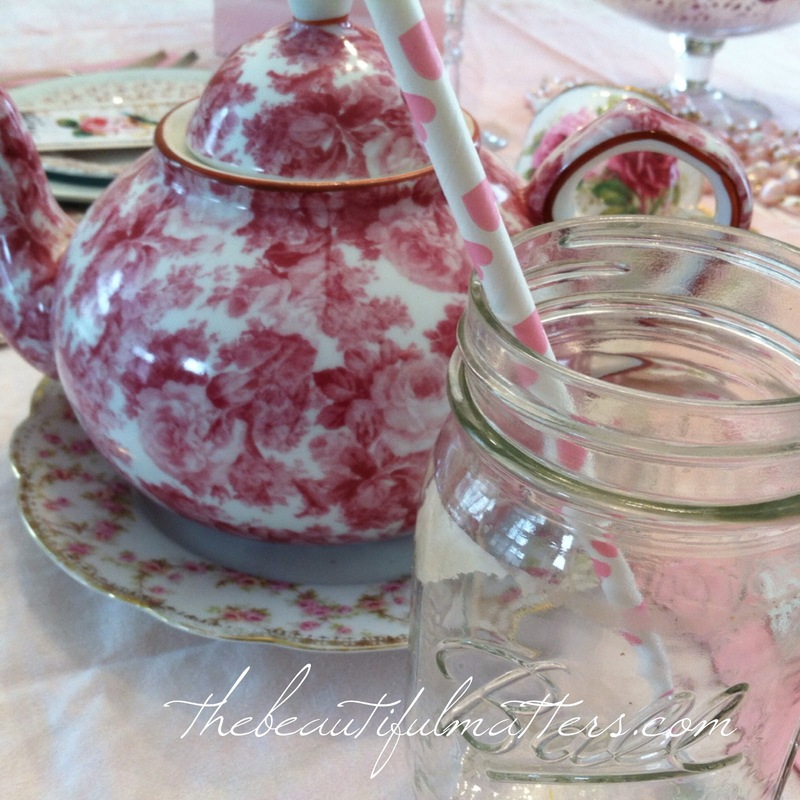 Silly, but I love the striped straws! Wonderful post. I love that you can find paper straws again. Much nicer than the plastic. Fun and retro. thanks Lori. I had a lot of fun putting this together. Have fun with yours! I'm visiting from Home and Garden Thursday. 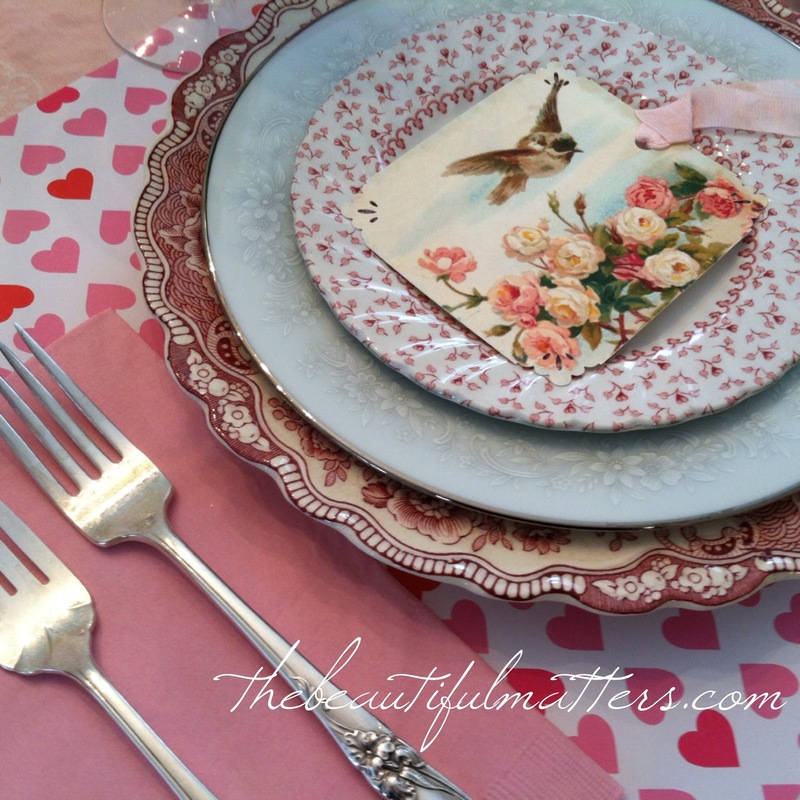 Your Valentine table for two is beautiful. So nice what you had to say about your husband and your love for one another. Thanks for sharing. I love your gifts and all of your pretty touches. I am your newest follower, come and follow me back!! What a wonderful tribute to your husband. After many years and much hard work we are lucky to be able to say we still love our husbands and are happy that we married them. 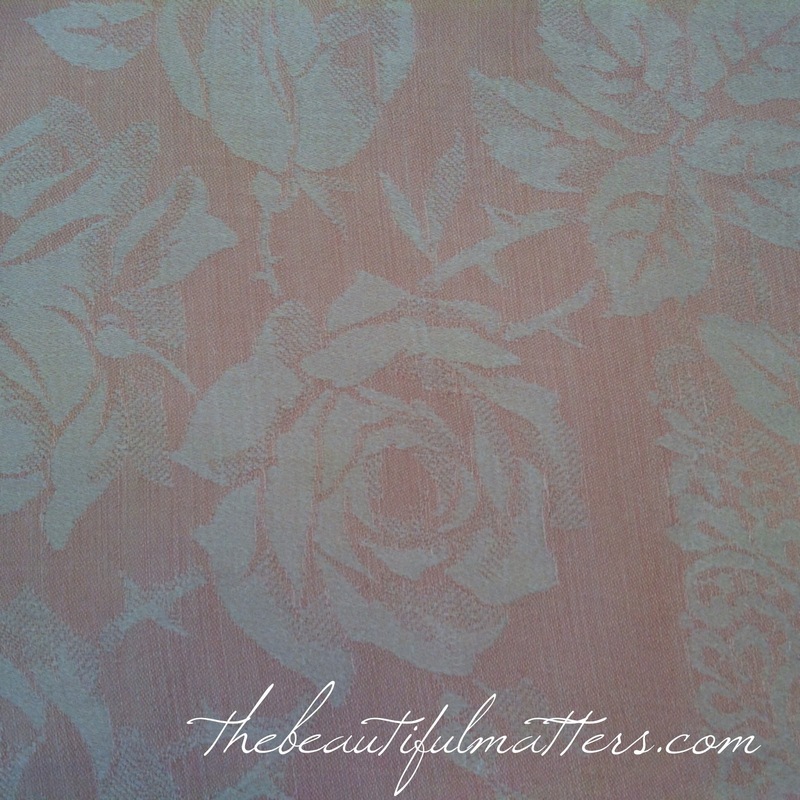 On a side note, I just wanted to say," I love the soft sweet roses on the beautiful tablecloth." Linda decoracion, muy romantica, lindo estilo. So different and adorable!! 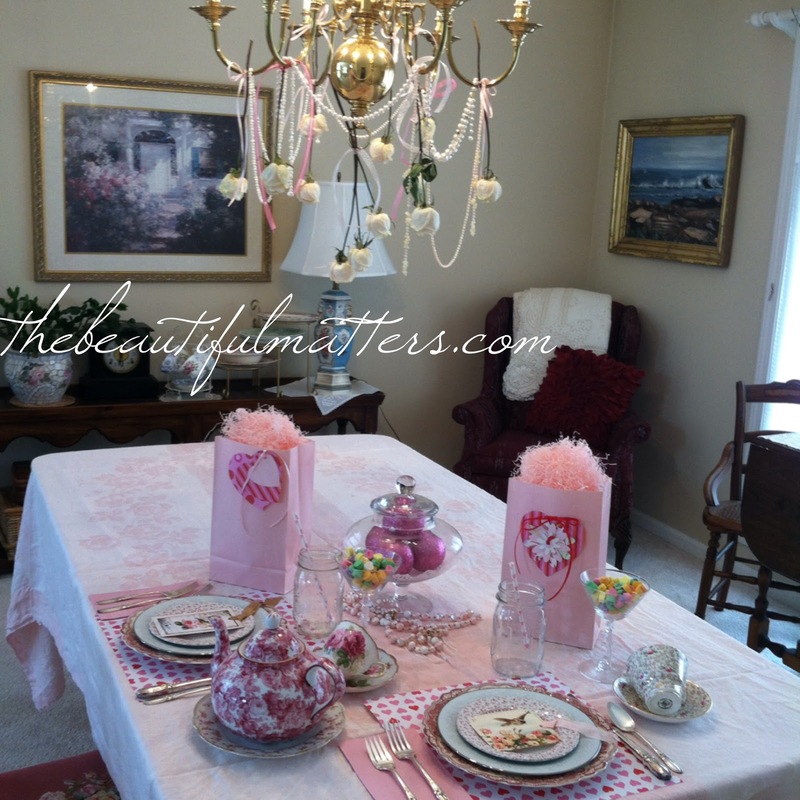 Love the chandy and the fluffy bags! This is beautiful! I am with you on appreciating a love that has stood the test of time and a family of three. That is no easy task in itself! 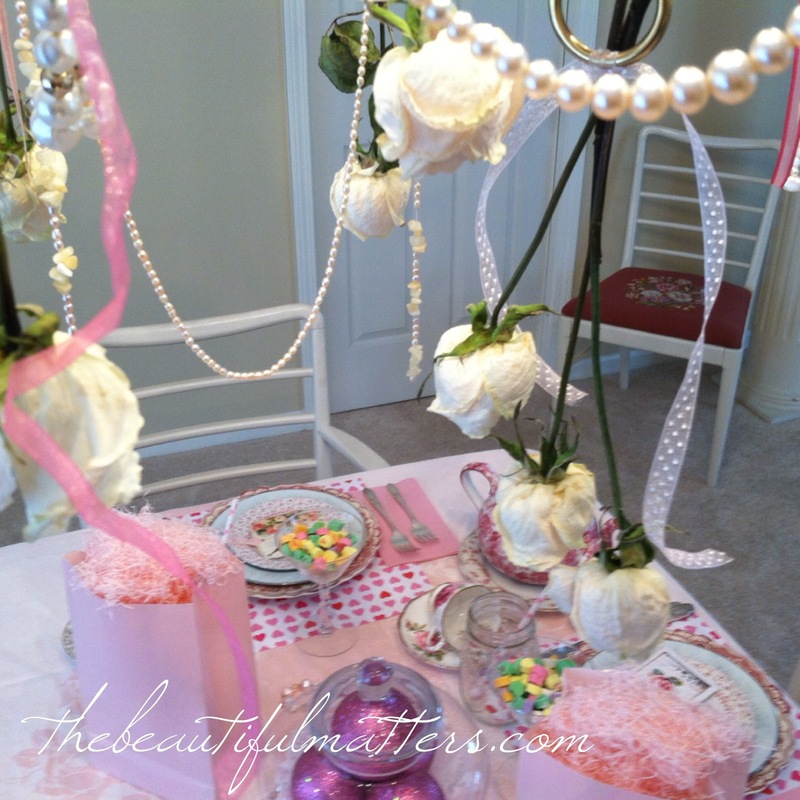 Your table is so romantic and pretty! 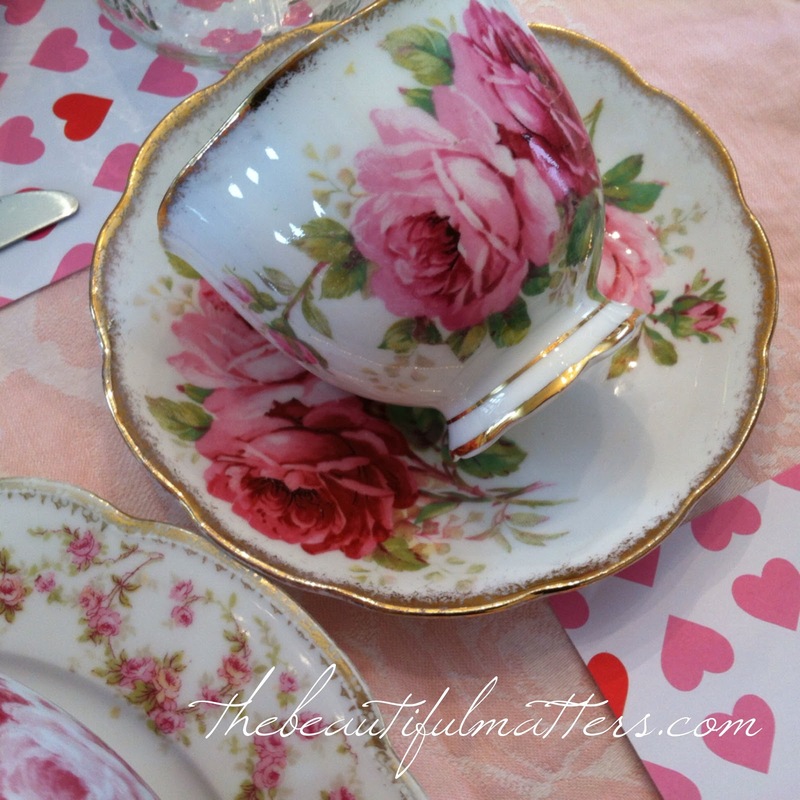 I love your Royal Albert teacup! Thanks for stopping by and joining HSH! I will put you in my blogroll too! I LOVE tea post! I am so sorry for your loss Kitty. Blessings to you. The very very best part of your post are your loving words for your dearest, I completely agree about the deep love of a long relationship. sorry you've been sick . . . thank you for the kind words. 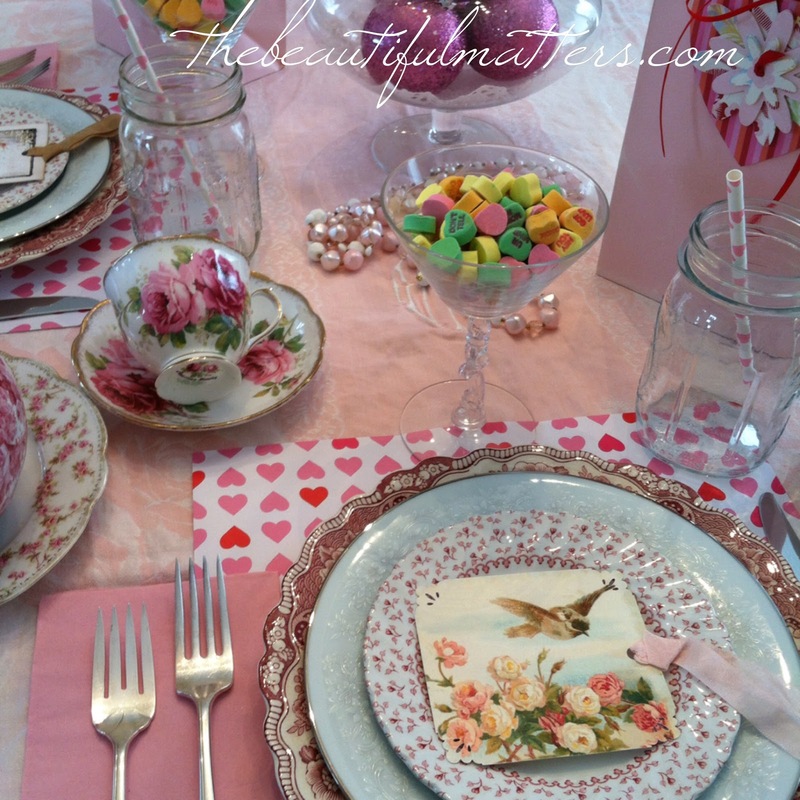 A very sweet table for you and your husband to enjoy. 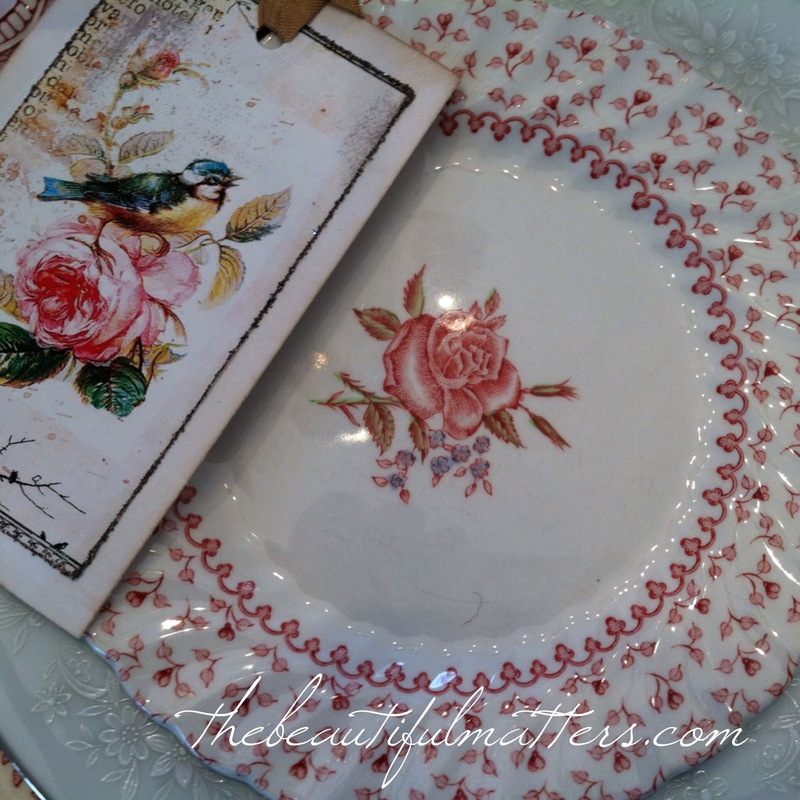 The china is lovely and I love the white orchid flatware. The sentiment is always what matters the most and the sentiment expressed by you for your husband is one of enduring love. Wonderful!